Philippe Graffin's voyage of discovery researching little-known works for the violin by well-known masters has already seen a particularly well-received disc of Rare French works for violin and orchestra, and now we have a disc of works for violin and piano that also emerged from his investigations. These pieces have been uncovered in private collections and various libraries, including the Library of Congress in Washington, D.C. 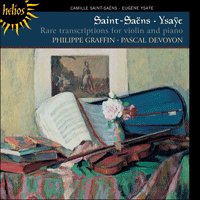 These are fascinating transcriptions by Saint-Saëns, one of the most celebrated pianists of his time, and the equally celebrated violinist Ysaÿe. Having assisted in bringing them to light, Graffin performs them here with his customary virtuosity and grace, accompanied by the equally deft French pianist, Pascal Devoyon, on a disc that will educate, delight and amaze. Although often circumstantial, Saint-Saëns had a very personal relationship with the violin throughout his life. Inspired by friendship, the works presented here are an intimate counterpoint to his more ambitious output for the instrument. His earliest transcription, the Fantaisie on motifs from Carl Maria von Weber’s Oberon, was composed in 1850 when he was fifteen. It was in fact officially co-written with his friend, the violinist Achille Dien. While it is clear that both these young musicians were already virtuosos on their respective instruments, one suspects that the young pianist already challenged his violinist. Even though Saint-Saëns’s mature style is not yet evident, his enthusiasm for Weber’s work is palpable, as is the work’s second-degree humour, having fun not only with but also about the work. A few years later, in 1859, it was also for a newly acquainted friend—the precocious Spanish violinist Pablo de Sarasate—that Saint Saëns wrote his Caprice brillant, while they were both studying at the Paris Conservatoire. It constitutes a significant step forward from his attempts the previous year at writing a violin concerto. The original Caprice brillant had been thought lost by its author, who some twenty years later transformed and orchestrated it, with some interesting changes, into the third movement of the famous third Violin Concerto, also written for Sarasate. Yet Saint-Saëns had not forgotten its origins, and subsequently re-edited the finale of the third Violin Concerto, once again as a separate piece for violin and piano, the Allegro de concert. The Caprice brillant is a true duo where the pianist is an equal partner to the violinist. Its Lisztian piano part is a testament to Saint-Saëns’s phenomenal keyboard technique. Besides the curiosity of rediscovering the previous guise of a familiar piece, this setting also gives a hint about the spirit in which it was written: the Spanish character of the theme, a private tribute to Sarasate, the virtuosity as a game to be shared, and the visit to the very serious Wagner in the central episode only to be teased away naughtily. As transcriptions often originate from an artist’s frustration at not being able to play something loved deeply, it is all the more fascinating that Saint-Saëns, one of the most celebrated pianists of his time, chose to transcribe Chopin’s music for the violin. One of the greatest regrets in his life was not having heard Chopin play during his youth, and these two intimate nocturnes are a testimony to his love of Chopin the composer. Sarasate had already paved the way from Chopin to the violin with his transcription of the famous Nocturne in E flat major Op 9 No 2. But where a violinist would tend to emphasize Chopin’s melody by simply having the violin play the thematic line and leaving what is left to the keyboard, a pianist knows all too well that it is the harmony that is the essence of the music. With Saint-Saëns, the two instruments are more integrated and interact with one another: the violin seems an extension of the world of the piano. Saint-Saëns later befriended the great Belgian violinist Eugène Ysaÿe, whose inclination for chamber music made him a central figure in the renewal of French music. Saint-Saëns dedicated to him his first string quartet and the double concerto La muse et le poète (Op 132). Ysaÿe’s choice of the word ‘adaptation’ instead of ‘transcription’ applied to his treatment of Chopin’s E minor Waltz tells us what he intended. With its added middle section making it sound almost like an original violin piece à la Wieniawski or Vieuxtemps, it was written for his own use. Adapting piano repertoire for the violin was, for Ysaÿe, a sort of ‘postgraduate’ way to improve his technique, pianistic virtuosity challenging any violinistic habit or comfort. It is a practice that he passed on to his students. A more surprising and audacious enterprise in that domain is Ysaÿe’s adaptation of Chopin’s Ballade No 1 in G minor Op 23. This forgotten manuscript, written in London while Ysaÿe was in exile during the First World War, bears witness to an intimate struggle to find solutions to amazingly complicated physical problems. He sometimes wrote so many fingerings on top of each other that one can barely see the notes. Ysaÿe’s adaptation is a masterly violin lesson, not only for its extraordinary and imaginative use of the fingerboard (which makes up for the lack of the range given by a whole keyboard), but also for its sensitivity to colour, especially in response to Chopin’s music. As a result, there is much artistic licence. In fact the words on the front page—‘interpreted and fingered by Ysaÿe’—reveal his stance. From the idiosyncratic technical means, such as the final scale in thirds gliding into a glissando, or the Impressionistic harmonics at the end, these pages are a testament to Ysaÿe’s own interpretative art. This score was never published. It was nevertheless an inspiration for Ysaÿe to write a Ballade of his own a few years later, the third Sonata for solo violin Op 27, which remains his best-known work. At one point in the manuscript of the Chopin transcription, Ysaÿe has scribbled the word ‘orchestra?’, which suggests that he may also have intended to write a version with orchestra, as was the case for his Caprice d’après l’Étude en forme de valse. Saint-Saëns was so pleased with this arrangement of his Étude en forme de valse Op 52 No 6, that he saw it fit for his own publisher, Durand, to include it in his catalogue. On hearing the first performance, Debussy reported: ‘M. Ysaÿe followed with a performance of his own transcription of an Étude en forme de valse by Mr C. Saint-Saëns, written by the latter for the piano … there are some people who will never understand a joke; why would it be forbidden for Mr C. Saint-Saëns to have some humour?’ However caustic these words may seem, Debussy nevertheless had to concede that Saint-Saëns’s music has a rare quality that is often overlooked: its wit. Another example is his little piece L’air de la pendule. The front page of the manuscript explains the inspiration for the piece: ‘In memory of my sojourn at the King and Queen of Belgium, in September 1918. This air was copied from an ancient pendulum [which could be seen from their residence] representing Cupid holding a lyre, and next to him was a music stand whereupon lay a sheet along which was written the air that follows.’ The choice of the violin here is again for practical reasons: Queen Elisabeth of Belgium was a good violinist, a student and close friend of Ysaÿe. She was a patron of music and a muse for many musicians. Saint-Saëns had often accompanied her at the piano privately. The few pizzicati of Cupid’s lyre lead us to another work, the Fantaisie Op 124 for violin and harp (1907) that belongs to the later period of Saint-Saëns’s creative life. Even though dedicated and especially written for two sisters, Marianne and Clara Eisler, it really belongs to Sarasate, who died soon after it was written. A remembrance of things past, the various delicate shades of the Fantaisie’s texture and harmonies, where Saint-Saëns’s piano is transcended into the more ephemeral sound of an imaginary guitar, and the Spanish ostinato suggest a farewell to their youth, and makes for a rare metaphysical touch in his music. The works of Fauré, early Ravel and Debussy, whose Sonata for violin (1917) interestingly also contains a longing reference to Spain, are all echoed here in a joint attempt for an imaginary new ‘French music’. I wish to thank Hugh MacDonald and Steven Isserlis for bringing the Caprice brillant to our attention, as well as the Library of Congress in Washington, D.C. and Jennifer Morsches for their invaluable help. Toute sa vie durant, Saint-Saëns a entretenu avec le violon une relation étonnamment personnelle, souvent attachée à des circonstances précises. Souvent inspirées par l’amitié, les œuvres présentes sur ce disque sont autant de contrepoints intimes aux partitions plus ambitieuses qu’il créa pour cet instrument. Sa transcription la plus ancienne, la Fantaisie sur des motifs d’Oberon de Carl Maria von Weber, vit le jour en 1850, alors qu’il n’avait que quinze ans. Officiellement, cette page est le fruit d’un travail d’écriture réalisé conjointement avec son ami, le violoniste Achille Dien. Si ces deux jeunes musiciens étaient déjà des virtuoses de leurs instruments respectifs, il semblerait bien que le jeune pianiste ait défié les ressources du violoniste. Certes, le style de maturité de Saint-Saëns n’y est pas encore perceptible, pour autant son enthousiasme pour l’œuvre de Weber transparaît clairement, tout comme son humour au second degré qui joue non seulement avec la partition mais se joue aussi de celle-ci. Quelques années plus tard, en 1859, ce fut à nouveau par amitié que Saint-Saëns écrivit son Caprice brillant destiné cette fois-ci à un violoniste espagnol qu’il venait de rencontrer—le très précoce Pablo de Sarasate. Tous deux étaient alors étudiants au Conservatoire de Paris. Le Caprice brillant marque une étape décisive par rapport à l’année précédente au cours de laquelle il avait tenté d’écrire un concerto pour violon. Par la suite, Saint-Saëns crut avoir perdu la version originale du Caprice brillant. Une vingtaine d’années plus tard, il la transforma, l’orchestra avec quelques changements intéressants et en fit le troisième mouvement du célèbre Concerto pour violon no 3, également écrit pour Sarasate. Saint-Saëns n’en avait cependant pas oublié ses origines plus modestes: il arrangea le finale du troisième Concerto pour violon en une pièce séparée pour violon et piano, connue sous le titre d’Allegro de concert. Le Caprice brillant est un véritable duo où le pianiste est l’égal du violoniste. Doté d’une partie de piano lisztienne, il témoigne de la technique phénoménale dont Saint-Saëns disposait. Non seulement il répond à la curiosité suscitée par la première mouture d’une pièce aussi familière, mais il révèle aussi l’esprit dans lequel elle fut conçue: le caractère espagnol du thème, l’hommage personnel à son ami Sarasate, la virtuosité perçue comme un plaisir à partager, et dans l’épisode central, la courte visite au très sérieux Wagner dont il prend rapidement congé, non sans malice. L’acte de transcrire émane souvent de la frustration qu’éprouve un artiste de ne pouvoir jouer quelque chose qu’il aime profondément. C’est pourquoi il est si fascinant que Saint-Saëns, un des pianistes les plus illustres de son époque, ait choisi de transcrire pour le violon la musique de Chopin. Un des grands regrets de sa vie aura été, durant sa jeunesse, de ne pas avoir entendu Chopin jouer. Ces deux nocturnes intimes témoignent de l’amour qu’il lui portait. Sarasate avait déjà inauguré l’idée d’interpréter Chopin au violon en transcrivant le célèbre Nocturne en mi bémol majeur op. 9 no 2. Mais là où un violoniste privilégiait la mélodie en octroyant au violon la ligne thématique et en laissant le reste à la main gauche du clavier, un pianiste n’était que trop conscient du rôle essentiel de l’harmonie. Chez Saint-Saëns, donc, les deux instruments sont plus étroitement intégrés, témoignant d’une interaction constante: le violon semble y être une extension de l’univers pianistique. Saint-Saëns se prit ultérieurement d’amitié pour le grand violoniste belge Eugène Ysaÿe dont le goût pour la musique de chambre en fit une personnalité centrale du renouveau de la musique française. Saint-Saëns lui dédia son Premier Quatuor à cordes et le double concerto La muse et le poète (op. 132). En retenant le terme «adaptation» plutôt que «transcription» à propos de son traitement de la Valse en mi mineur de Chopin, Ysaÿe divulguait ses intentions. Réalisant une pièce destinée à son propre usage, il n’hésita pas à ajouter une section centrale donnant ainsi l’impression d’une composition pour violon originale à la Wieniawski ou Vieuxtemps. Pour Ysaÿe, adapter le répertoire de piano pour le violon était une manière d’outrepasser sa technique puisque la virtuosité pianistique remettait en cause les habitudes et le confort propres au violon. Il s’agit d’ailleurs d’une pratique qu’il conseillait à ses élèves. Dans ce domaine, Ysaÿe s’attacha à la réalisation d’une entreprise plus ambitieuse et plus surprenante: l’adaptation de la Ballade no 1 en sol mineur op. 23 de Chopin. Ecrit à Londres où Ysaÿe s’exila durant la Première Guerre mondiale, ce manuscrit oublié témoigne de la lutte intime à laquelle il se livra pour trouver des solutions appropriées à des problèmes physiques d’une difficulté vertigineuse. L’autographe est tellement surchargé d’annotations de doigtés différents empilées les unes sur les autres que l’on peine à en deviner les notes. L’adaptation d’Ysaÿe est une magistrale leçon de violon, que ce soit pour l’utilisation imaginatif du manche (compensant ainsi l’ambitus restreint du violon par rapport à celui du clavier), ou pour sa sensibilité à la couleur ou au timbre en réponse à la musique de Chopin. Il y exerce, en corollaire, une certaine licence artistique. En fait, les mots apposés sur la page de garde—«interprété et doigté par Ysaÿe»—éclairent bien sa démarche. Avec des moyens techniques idiosyncrasiques tels que la gamme finale en tierces filant en glissando ou les harmoniques impressionnistes de la fin, ces pages sont autant de testaments de l’art de l’interprétation d’Ysaÿe. Cette partition demeura inédite. Ce fut pourtant en elle que, quelques années plus tard, Ysaÿe puisa son inspiration pour la composition d’une ballade de son cru, la troisième Sonate pour violon seul op. 27, qui demeure une de ses œuvres les plus connues. Le manuscrit de la transcription de Chopin comporte, à un certain endroit, le mot «orchestre?» griffonné par Ysaÿe. Il aurait donc considéré, pendant un certain temps du moins, la réalisation d’une version avec orchestre comme dans le cas de son Caprice d’après l’Étude en forme de valse. Saint-Saëns avait apprécié l’arrangement de son Étude en forme de valse op. 52 no 6 à tel point qu’il jugea cette page digne d’être publiée par sa propre maison d’édition, Durand, qui l’incorpora dûment à son catalogue. L’air de la pendule en est un témoignage de l’esprit de Saint-Saëns. La page de titre du manuscrit explique que l’œuvre fut conçue «en souvenir de mon séjour chez le Roi et la Reine de Belgique, en septembre 1918. Cet air fut copié à partir d’une ancienne pendule [qu’il vit à leur résidence] représentant Cupide tenant une lyre, et à côté de lui se trouvait un pupitre où était posée une feuille sur laquelle était écrit l’air qui suit». Le choix du violon est une fois encore lié aux circonstances: la reine Elisabeth de Belgique était elle-même une bonne violoniste, élève et amie intime d’Ysaÿe. Muse pour maints musiciens, elle était aussi une véritable protectrice de la musique. En privé, Saint-Saëns l’accompagna souvent au piano. La Fantaisie pour violon et harpe op. 124 (1907) date de la période plus tardive de sa carrière de compositeur. Commandées par les sœurs Marianne et Clara Eisler, lesquelles en sont aussi les dédicataires, c’est en fait toujours pour le violon de Sarasate mort peu après sa composition, que ces notes ont été écrites. En un ultime hommage à leur jeunesse, de l’ostinato espagnol final au son du piano de Saint-Saëns transcendé à travers la harpe en une guitare éphémère, ces pages sont d’une rare portée métaphysique chez ce compositeur. On y découvre l’écho des œuvres de Fauré, des pages de jeunesse de Ravel et de Debussy dont la Sonate pour violon (1917) comporte également une longue référence à l’Espagne. On y perçoit l’effort commun entrepris pour une nouvelle «musique française» imaginaire. Zu der Violine hatte Saint-Saëns sein Leben lang ein sehr persönliches Verhältnis, auch wenn sich dies oft eher zufällig äußerte. Die hier vorliegenden Werke wurden durch eine Freundschaft inspiriert und haben, im Gegensatz zu seinen ehrgeizigeren Werken für das Instrument, einen recht intimen Charakter. Die Fantaisie über Motive aus Carl Maria von Webers Oberon ist seine früheste Transkription, die er im Jahre 1850 komponierte, als er fünfzehn Jahre alt war. Genaugenommen entstand sie in Kooperation mit seinem Freund, dem Geiger Achille Dien. Es ist offensichtlich, dass die beiden jungen Musiker bereits Virtuosen auf ihren jeweiligen Instrumenten waren, jedoch scheint es, als ob der junge Pianist den jungen Geiger schon herausforderte. Obwohl der reife Stil von Saint-Saëns noch nicht erkennbar ist, ist doch sein Enthusiasmus für Weber auffällig, ebenso wie sein Humor, wobei die Heiterkeit nicht nur innerhalb, sondern auch außerhalb des Werkes zum Ausdruck kommt. Schon einige der allerfrühesten Kompositionsversuche von Saint-Saëns weisen diese humoristische Neigung auf. 1859 schrieb Saint-Saëns, ebenfalls für einen neuen Freund, den frühreifen spanischen Geiger Pablo de Sarasate, sein Caprice brillant, als sie beide am Pariser Conservatoire studierten. Gegenüber seinen Versuchen im Jahr zuvor, ein Violinkonzert zu schreiben stellt dieses Werk einen wichtigen Schritt nach vorn dar. Der Autor hatte sein ursprüngliches Caprice brillant verloren geglaubt und es etwa zwanzig Jahre später orchestriert und in den dritten Satz des berühmten Dritten Violinkonzerts (ebenfalls für Sarasate) transformiert, wobei er einige interessante Änderungen vornahm. Jedoch hatte Saint-Saëns die Ursprünge des Stücks nicht vergessen, so dass er schließlich das Finale des Dritten Violinkonzerts wiederum umschrieb und es als eigenständiges Werk für Violine und Klavier mit dem Titel Allegro de concert arrangierte. Das Caprice brillant ist ein wirkliches Duo, bei dem Pianist und Geiger gleichberechtigte Partner sind. Der Lisztsche Stil, der im Klavierpart zum Ausdruck kommt, ist ein Hinweis auf Saint-Saëns’ phänomenale Technik. Diese Fassung besitzt nicht nur den Reiz, die eigentliche Gestalt eines bekannten Stückes wiederzuentdecken, sondern sie verrät auch etwas über den Geist, mit der sie geschrieben wurde: der spanische Charakter des Themas, eine persönliche Huldigung an seinen Freund Sarasate, die spielerische Virtuosität beider Stimmen und eine Stippvisite bei dem sehr ernsten Wagner im Mittelteil, der jedoch auf kecke Art und Weise wieder hinauskomplimentiert wird. Da Bearbeitungen oft aus der Frustration eines Künstlers heraus entstehen, ein geliebtes Stück nicht spielen zu können, ist es umso faszinierender, dass Saint-Saëns, einer der gefeiertsten Pianisten seiner Zeit, Werke von Chopin für die Violine arrangierte. Er bedauerte es sehr, in seiner Jugend Chopin nie gehört zu haben und diese beiden intimen Nocturnes sind ein Zeugnis für seine Verehrung Chopins. Sarasate hatte bereits mit seiner Transkription des berühmten Nocturne in Es-Dur op. 9 Nr. 2 den Weg von Chopin zur Violine geebnet. Ein Geiger tendiert jedoch eher dazu, Chopins Melodie hervorzuheben und die Violine einfach die thematische Linie spielen zu lassen und den Rest dem Klavier zu überlassen, während ein Pianist nur zu gut weiß, dass die Harmonien das Wesentliche dieser Musik sind. Bei Saint-Saëns sind beide Instrumente gleichermaßen in ein Ganzes integriert und interagieren miteinander: die Violine scheint wie eine Erweiterung der Welt des Klaviers zu sein. Saint-Saëns freundete sich später mit dem großen belgischen Geiger Eugène Ysaÿe an, dessen Begeisterung für Kammermusik ihn zu einer zentralen Figur der Wiederbelebung französischer Musik machte. Saint-Saëns widmete ihm sein erstes Streichquartett und sein Doppelkonzert La muse et le poète (op. 132). Die Tatsache, dass Ysaÿe seine Bearbeitung des Valse von Chopin „Adaptation“ und nicht „Transkription“ nannte, verrät seine Absicht. Der hinzugefügte Mittelteil klingt fast wie ein Original-Violinstück à la Wieniawski oder Vieuxtemps und wurde für den eigenen Gebrauch geschrieben. Das Klavierrepertoire für die Violine zu bearbeiten, war für Ysaÿe eine Art „Graduiertenübung“ um seine Technik zu verbessern, wobei die pianistische Virtuosität alles geigerische Können herausforderte. Diese Vorgehensweise gab er auch an seine Schüler weiter. Ein noch überraschenderes und gewagteres Unternehmen auf diesem Gebiet ist Ysaÿes Adaptation von Chopins Ballade Nr. 1 in g-Moll, op. 23. Dieses vergessene Manuskript, das im Londoner Exil während des Ersten Weltkrieges entstand, bezeugt einen inneren Kampf um Lösungen zu ungeheuer komplizierten physischen Problemen. Manchmal schrieb er so viele Fingersätze übereinander, dass man die Noten kaum noch erkennen kann. Ysaÿes Adaptation ist eine meisterhafte Geigenlektion, nicht nur aufgrund des außergewöhnlichen und phantasievollen Einsatzes des Griffbretts (was den Nachteil des geringeren Tonumfangs der Violine gegenüber dem des Klaviers ausgleicht), sondern auch aufgrund seiner einfühlsamen Farbgebung, besonders in Bezug auf Chopins Werk. Es ist hier ein großes Maß an künstlerischer Freiheit vorhanden. In der Tat enthüllen schon die Worte auf der Titelseite—„Interpretation und Fingersatz von Ysaÿe“—seine Stellung. Die eigenwilligen technischen Mittel, wie etwa die letzte Tonleiter, die in Terzen in ein Glissando gleitet, oder auch die impressionistischen Obertöne am Ende dokumentieren Ysaÿes Kunst der Interpretation. Die Partitur ist nie publiziert worden. Trotzdem war das Werk die Inspirationsquelle für Ysaÿe, einige Jahre später eine eigene Ballade zu komponieren: die 3. Sonate für Solovioline, op. 27, die noch heute sein bekanntestes Werk ist. An einer Stelle im Manuskript der Chopin-Transkription notierte Ysaÿe sich das Wort „Orchester?“, was andeutet, dass die Transkription zu einem bestimmten Zeitpunkt wohl auch als Version mit Orchester gedacht war, wie es der Fall bei seinem Caprice d’après l’Étude en forme de valse ist. Saint-Saëns mochte diese Bearbeitung seiner Étude en forme de valse op. 52 Nr. 6 so sehr, dass er sie in den Katalog seines Verlegers Durand aufnehmen wollte. Ein Beispiel von Saint-Saëns’ Witz ist sein kleines Stück L’air de la pendule. Auf der Titelseite des Manuskripts steht folgende erläuternde Bemerkung: „Im Andenken an meinen Aufenthalt bei dem König und der Königin von Belgien im September 1918. Diese Air stammt von einem alten Pendel [das er auf ihrer Residenz gesehen hatte, Anm. d. Verf. ], das Amor darstellt, der eine Lyra hält und neben sich einen Notenständer stehen hat, auf dem ein Blatt Papier mit der folgenden Air war“. Die Wahl der Violine lässt sich wiederum durch die Umstände erklären: Königin Elisabeth von Belgien war eine begabte Geigerin, Schülerin und gute Freundin Ysaÿes. Sie war eine Musikmäzenin und eine Muse für viele Musiker. Saint-Saëns hatte sie oft im privaten Kreise auf dem Klavier begleitet. Die Pizzicati der Lyra Amors führen uns zu einem weiteren Werk, der Fantaisie op. 124 für Violine und Harfe (1907), das der späteren Schaffensperiode seines Lebens angehört. Obwohl es zwei Schwestern, Marianne und Clara Eisler, gewidmet und für sie geschrieben ist, gehört es in Wahrheit Sarasate, der kurz nach der Entstehung des Werkes starb. Es ist eine Erinnerung an die Vergangenheit, die verschiedenen Schattierungen der Textur und der Harmonien, bei denen Saint-Saëns’ Klavier in die ephemerischen Klänge einer imaginären Gitarre hinübergleitet und das spanische Ostinato einen Abschied von der Jugend andeutet, sorgen für einen ungewohnt metaphysischen Hauch in seiner Musik. Die Werke von Fauré, dem frühen Ravel und Debussy, dessen Violinsonate (1917) interessanterweise auch einen sehnsüchtigen Verweis auf Spanien enthält, finden alle Widerhall in diesem Versuch, eine imaginäre, neue „französische Musik“ zu schaffen.